I can’t say for certain, but the year would indicate this is a MB or GPW body and parts. No condition noted and no pics included. It’s been available since at least Nov 24th. It appears a bit rough and the pics don’t allow for much scrutiny. 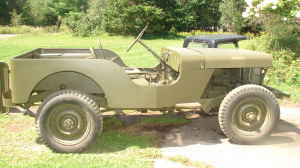 This might be a ’44 or a ’45. It’s definitely a project. Lots of parts of pieces which the seller lists on the Craigslist Ad. 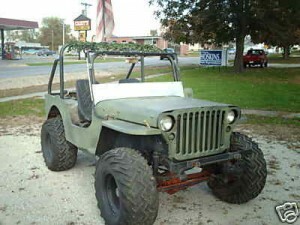 There’s some good updates to this jeep and it looks good too, but there’s also some unmentioned items that need fixing. While it doesn’t appear to be in perfect condition, it does appear to be in very good, completely stock condition. This appears to be an excellent restoration candidate. 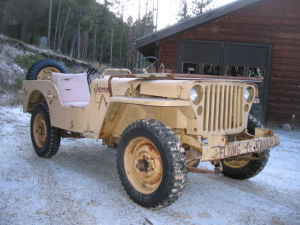 This jeep has a tailgate and a later model grille,but no gas tank inlet. Maybe it’s a repro tub? November 13, 2008 • CATEGORIES: MB • TAGS: Nice. This seller doesn’t want to part out what he’s got, but it appears he has a good collection of parts. I’ve listed four of the 31 items he lists. “1. Chassis with turned brake drums, new brake cylinders, new bearings, and uncertain wheels. 2. 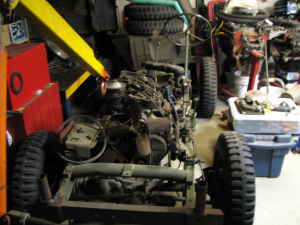 Engine (2A), transmission (T84) and transfer case. Late exhaust and parking brake. 3. 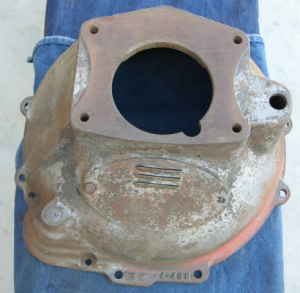 Spare block with broken carb but good manifolds…turns over. This MB looks like a play jeep. It does not appear to be licensed. I wonder if the stock axles were upgraded. I’d think that power and those tires would be hard on stock MB axles. 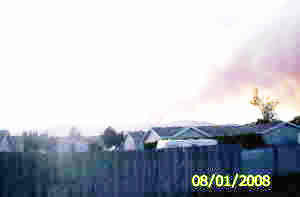 This is right over the hill from me. I really don’t know how rare these are, but I could run and pick it up if someone’s interested in it. It isn’t clear to me whether this runs or not. 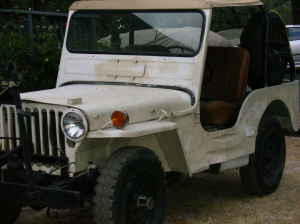 This appears to have a later model windshield. It’s hard to tell much else from the pictures. 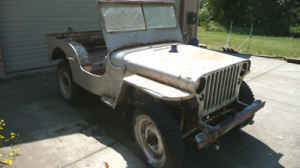 I think the price is a bit high on this jeep, given it isn’t running and has no title, but if the price drops, this could be a reasonable project. It sounds like the project has a lot of new parts that just need to be put together, though I suspect, as usual, it will be a bit more complicated than that. Though it’s in ok condition, these don’t pop up everyday. For those rebuilding MBs, there might be something here. The image on the Ad was a bit dark, so I lightened up. I don’t see a Jeep, but I do see smoke. The top on this MB is unusual. Is that a custom or aftermarket top? I can’t say for sure this is an MB, it’s just my guess. 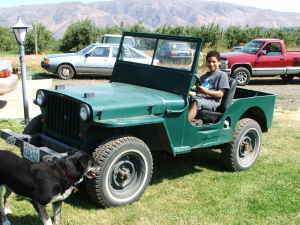 This jeep is located on the Oregon/Cali border near highway 101, so the drive alone is worth getting the jeep. This doesn't look in too bad of shape. 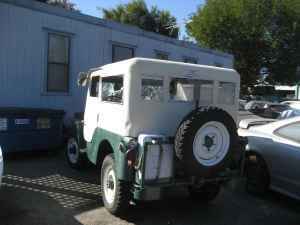 The seller describes the body as fair to poor, but I've seen many worse bodies than this one. 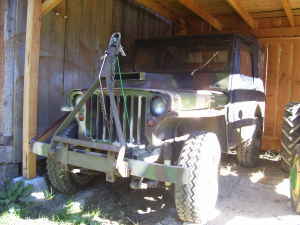 "Body: Fair to poor condition, areas of rust.Engine: Has not run in 5 years.Tires: 5 in good condition.Other: Fenders & gas tank in good condition.Many usable parts if full restoration is not your thing.Shipping/Transportation will be the buyers responsibilityI'm located in California two miles south of the Oregon border on highway 101. 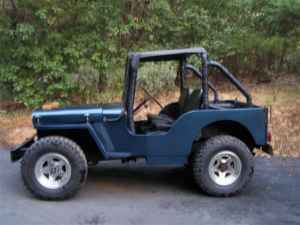 I can be reached at (707)487-5808"
The seller states $12000 was spent on the restoration of this CJ-3A and that it will now go easily down Cali highways at 80mph. My response would be, for starters, how does the hood stay down at 80mph, because there is only a hood latch on the passenger side fender (none on driver side) and no latch receptacles on the hood. 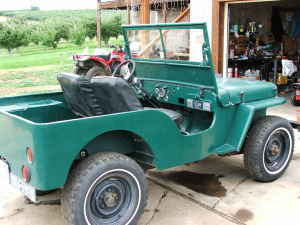 There's no mention of the MB body on this CJ-3A. The rear lights are missing on the driver's side. 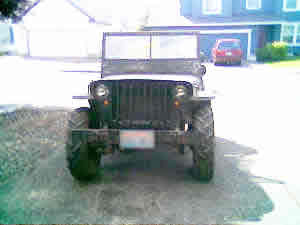 Rather than a CJ-3A, the grille appears to be a slat grille in the front (probably the most valuable part of this jeep). Caveat Emptor. 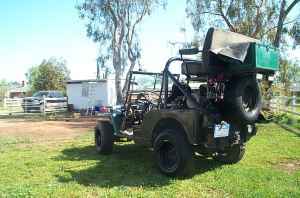 "4 wheel disk brakes, rancho suspension, 10,000 lb warn winch, power steering, power brakes, newer Ford 250 6 cylinder motor, new tires, new wheels, ground up restoration, new interior. This old jeep has been lovingly professionally restored to better than new condition. 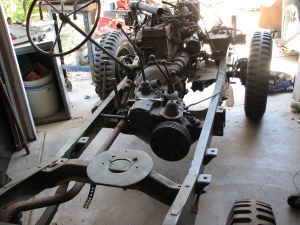 I had power disk brakes, power steering, Ford 250 motor, and rancho suspension added recently. I also had the interior completely redone for $2200 with commercial grade heavy duty vinyl and super heavy duty rubber on the floors. 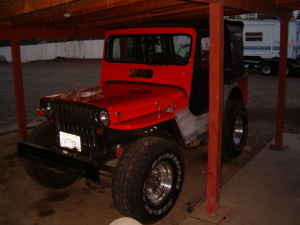 I also had the jeep painted with a $5500 base coat clear coat paint job which looks fantastic. 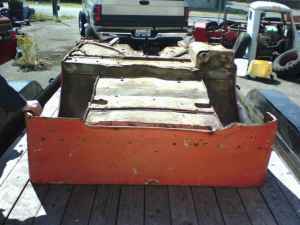 There's over $12,000 in restoration and now I've decided to sell it…."